Before releasing three heavily-acclaimed orchestral albums of his own compositions (The Seven Deadly Sins, The Seven Heavenly Virtues and Portraits: Wind, Thunder and Love) that have brought him into the company of the most revered jazz composers, Joseph Daley had earned a well-deserved reputation as a consummate sideman. His impeccable low-brass artistry has enhanced the music of heavyweights like Gil Evans, Carla Bley, Charlie Haden, Taj Mahal and so many others. But his first international prominence came about through his work with Rivers’ ensembles, particularly Sam’s groundbreaking Tuba Trio. It is this experience and his time spent at Sam’s legendary center of NYC’s ‘70s loft scene Studio RivBea that has inspired The Tuba Trio Chronicles. The third member of Sam’s Tuba Trio was the outstanding percussion master Warren Smith, whose presence on this album not only adds to the authenticity of the homage, but also powerfully displays the radiant musicianship that Warren has brought to so many jazz, classical and popular artists in his 60+ years in music. Rounding out the trio is the outstanding reedman/multi-instrumentalist Scott Robinson, whose inspired and imaginative playing does enormous justice to the artistry of the man who led the original Tuba Trio. Unlike most tribute attempts, this album does not focus upon Sam’s splendid compositions (with one very notable exception), nor does it attempt to recreate that classic music. Instead it aims for the realization of that most special substance of transcendence and spiritual force that was at the core of Sam’s music, utilizing the basic structure that Sam, Joseph and Warren explored so luminously some 30 to 40 years ago. And in that pursuit, these three gentlemen have succeeded in spectacular form – with the passion, urgency, virtuosity, majesty, boldness and unfettered imagination that were the hallmarks of Sam Rivers – all infused with the synergy and unity of spirit essential to music at this level. A significant variation on the original Tuba Trio approach – which essentially featured Sam on tenor, soprano, flute and piano, Joseph on tuba and euphonium, and Warren on drums – is that this trio employs a battery of instruments that calls to mind the stage setting for the Art Ensemble of Chicago, and at various times also displays the musical approach that marked some of their finest efforts. While Joseph stays primarily with open and muted tuba and euphonium (along with some highly effective and evocative electronically processed sounds on one piece), Warren employs more than a dozen instruments beside his standard drum set, including vibraphone, bass and standard marimba, gongs, chinese cymbals, crotales, tympani and a variety of small percussion. Scott performs on tenor and bass saxophones, bass flute, contrabass sarrusophone, contra alto clarinet, jazzophone, theremins, waterphone and various percussion. All of these instruments are used purely within the contexts of the music, with no contrivance or affectation, but simply because they suit the needs of the music in the best possible way. Improvisation and immediacy of creativity were always central to Sam’s music, even at the orchestral level. As marvelous as his compositions are, they were still designed as launching pads for exploration and development. The six Daley originals on this album provide the perfect setting for that same level of individual and collective creativity and spontaneity. The album is bookended by two pieces that are explorations of the intervallic, melodic and rhythmic concepts of Sam Rivers, as launching vehicles for improvisational segments. The opening piece Interplay features euphonium and tenor sax, while the closer, Proclamation is for tuba and bass sax. Episodic through written unison lines, fanfares, marches and long-toned themes within each piece, and fueled by Warren’s richly musical drums, the horns improvise individually and in tandem, shifting moods and textures with exhilarating freedom and disciplined musicality. The one Rivers composition is his best known and most often recorded work, Beatrice, his exquisite dedication to his beautiful partner-in-everything, Bea. With an extended vibraphone cadenza to introduce the gorgeous melody stated by tuba and bass flute, this is a somewhat straightforward and heartfelt exposition of a beautiful ballad that tells its own story, lovingly embellished by the trio. Beauty in a more darkly lustrous mood is on display on Daley’s Modality, with its deep blue modal line orchestrated into an improvisational vehicle for the dulcet sonorities of bass marimba, tuba and bass sax. Emergence, featuring euphonium, contrabass sarrusophone, jazzophone, tympani, bass drum, gongs and chinese cymbals is a thick, atmospheric improvisational tale that evokes an evolutionary pond where sonic elements emerge from the brew to declare their own individuality before diving back into the simmering pool – all building in intensity stoked by slashing cymbal and gongs. Joseph’s muted and open tuba growls, roars, rumbles sings, hums and hollers on Sonorous, launching a collective improvisation in the purest sense of the concept, as Scott’s jazzophone evokes everything from mellow sax to high brass and even a jaw harp. The sweeping 20+ minute Terrarium is the centerpiece of the album. Powerfully evocative, warmly lyrical, deeply emotive and utterly captivating, it’s a soundtrack of the minds of the artists who have created it. Abstract, yet sumptuously musical and – to use one of Sam’s favorite words – mellifluous, it unfolds again and again to reveal new treasures with each unfolding. With Joseph on both horns and Warren and Scott on multiple instruments painting upon the canvas of Joseph’s processed soundscape, it’s so vividly conceived that it could be a through-composed work. Throughout this superb album the three musicians color/shade, reflect/deflect, echo/contradict, call/respond, parry/thrust and swirl about in a pastiche of joyous abandon and transcendent expression. 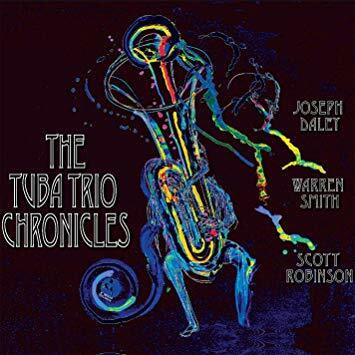 With sensational cover and interior artwork by Jeff Schlanger/music Witness, longtime visual art historian of the New York scene, The Tuba Trio Chronicles is a glorious tribute to the spirit of a most special man, and another sparkling jewel in the treasure that is Joseph Daley.